Stragglers won the toss and elected to make first use of the pitch. Joe Cavanagh and Matt Suckling got off to a watchful start against some accurate medium pace until the Chairman was removed, unfortunately tangling his wand up in his front pad before he could prevent the ball from kissing the stumps. Guest Bruno Rost joined Suckling and together the pair made a bright partnership of 40 before both edged accurate dobbler Owens to slip in quick succession. Perry and Savage steadied the ship and came ashore for lunch with wickets intact. Sensing a requirement to up the run rate after lunch, Perry pushed into the leg side, only to be trapped LBW. That wicket united the most productive partnership of the day as guest Mike James joined Paddy in the middle. Watchful at first, James took an over to get the pace of the pitch before unleashing a violent drive to the cover boundary. That was the shot which seemed to jump start his innings and Savage was treated to the best seat in the house to observe a spectacular 77 ball-century which included six maximums and eleven boundaries. Meanwhile Paddy had accumulated 48 of his own runs before falling, selflessly pushing on rather than securing what would have been a well deserved and chanceless half century. As James completed the single required to take him to three figures, the Stragglers captain waved his arms to signal the declaration. South Oxon Amateurs made a very good start before tea, punishing anything loose and finding the boundary regularly. Moriarty was particularly aggressive and looked very much like he had an appointment to get to. And indeed he did. Upon having his timbers rattled shortly after tea, he jogged straight to his car and drove off, thanking us for the game as he went. Off-spinning guest Harry Chapman, replacing Mark Hunt from the pavilion end, picked up three wickets in quick succession to give Stragglers a hope of opening up an end, however, the Amateurs captain Ed Phillips soon got himself set and looked very well organised against an attack showing signs of wear. He dealt with spin, pace on and off the ball with equal aplomb and took the somewhat outdated approach of waiting for the bad ball. Phillips was given very able support by Reynoldson, who grew in confidence to construct a partnership of 90. That partnership would displace thoughts of victory from the Stragglers’ minds, though with 100 to defend in the last 20 overs, containing for a draw seemed possible. Phillips, however, was brilliant and, along with two very capable young batsmen, was able to keep up with the rate required before accelerating to victory with three overs to spare. That the chase was eventually completed with ease tells the story of a very flat pitch and a very composed innings. 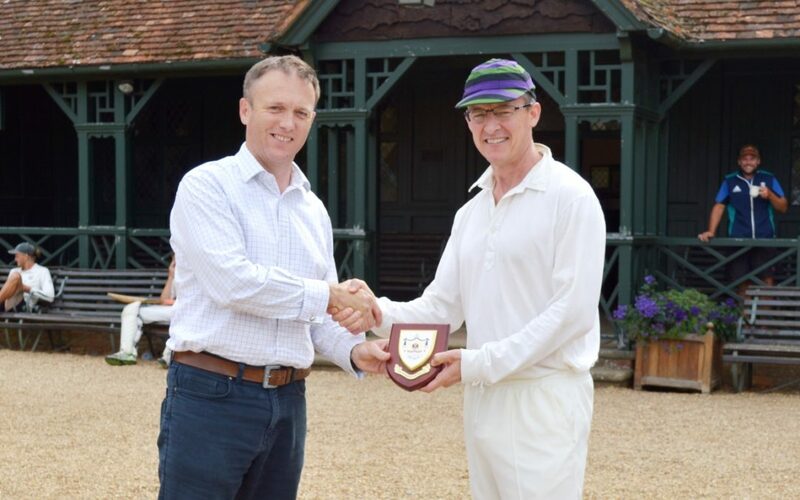 However, with nearly five hundred runs scored in the day and the game not reaching conclusion until within three overs of the allotted time, it was agreed that the fixture had been a great success.